[gradx,grady] = evaluateGradient(results,xq,yq) returns the interpolated values of gradients of the PDE solution results at the 2-D points specified in xq and yq. [gradx,grady,gradz] = evaluateGradient(results,xq,yq,zq) returns the interpolated gradients at the 3-D points specified in xq, yq, and zq. [___] = evaluateGradient(results,querypoints) returns the interpolated values of the gradients at the points specified in querypoints. [___] = evaluateGradient(___,iU) returns the interpolated values of the gradients for the system of equations for equation indices (components) iU. When solving a system of elliptic PDEs, specify iU after the input arguments in any of the previous syntaxes. The first dimension of gradx, grady, and, in 3-D case, gradz corresponds to query points. The second dimension corresponds to equation indices iU. [___] = evaluateGradient(___,iT) returns the interpolated values of the gradients for the time-dependent equation or system of time-dependent equations at times iT. When evaluating gradient for a time-dependent PDE, specify iT after the input arguments in any of the previous syntaxes. For a system of time-dependent equations, specify both time indices iT and equation indices (components) iU. The first dimension of gradx, grady, and, in 3-D case, gradz corresponds to query points. 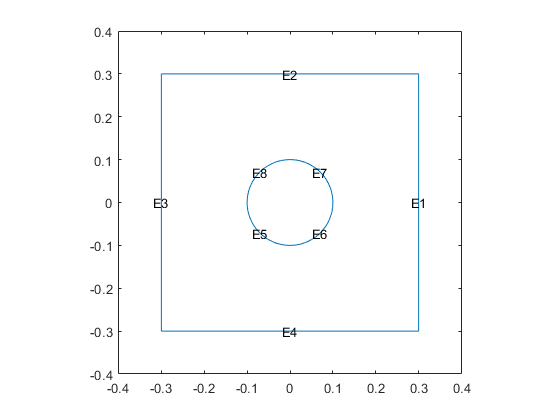 For a single time-dependent PDE, the second dimension corresponds to time-steps iT. 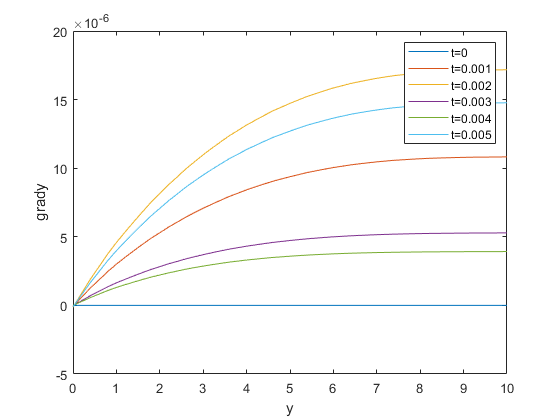 For a system of time-dependent PDEs, the second dimension corresponds to equation indices iU, and the third dimension corresponds to time-steps iT. 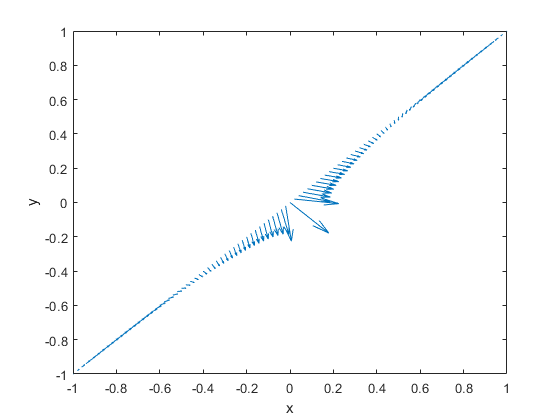 Evaluate gradients of the solution to a scalar elliptic problem along a line. Plot the results. Evaluate gradients of the solution along the straight line from (x,y)=(-1,-1) to (1,1). Plot the results as a quiver plot by using quiver. Calculate gradients for the mean exit time of a Brownian particle from a region that contains absorbing (escape) boundaries and reflecting boundaries. Use the Poisson's equation with constant coefficients and 3-D rectangular block geometry to model this problem. 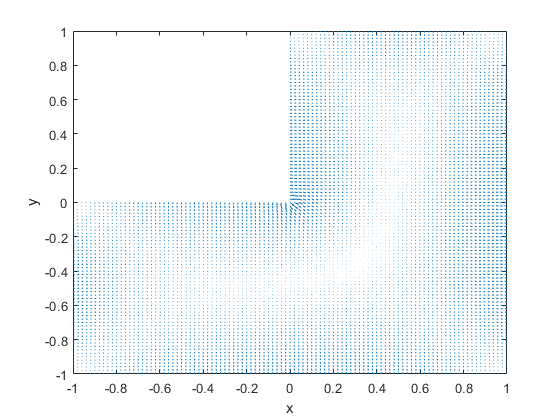 Create a grid and interpolate gradients of the solution to the grid. Reshape the gradients to the shape of the grid and plot the gradients. Solve a scalar elliptic problem and interpolate gradients of the solution to a dense grid. Use a query matrix to specify the grid. 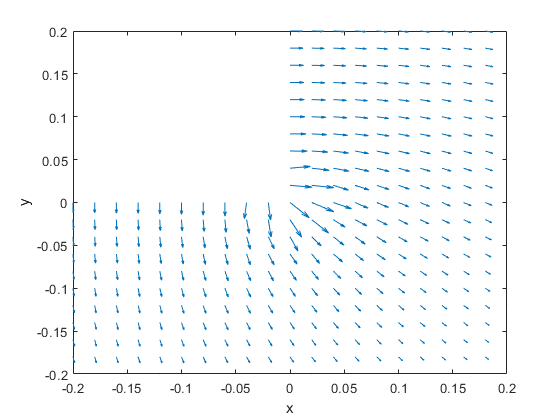 Interpolate gradients of the solution to the grid from -1 to 1 in each direction. Plot the result using the quiver plotting function. Zoom in on a particular part of the plot to see more details. For example, limit the plotting range to 0.2 in each direction. 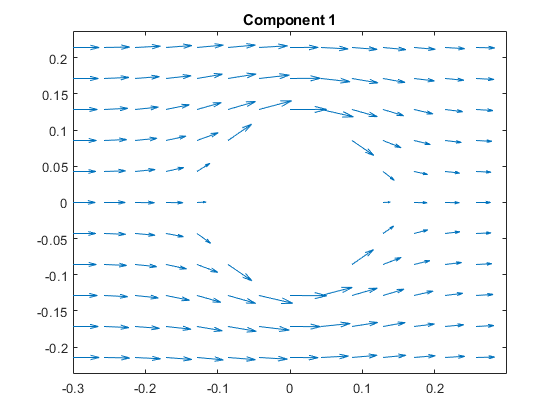 Evaluate gradients of the solution to a two-component elliptic system and plot the results. Create a PDE model for two components. Create the 2-D geometry as a rectangle with a circular hole in its center. For details about creating the geometry, see the example in Solve PDEs with Constant Boundary Conditions. Include the geometry in the model and view the geometry. Set the boundary conditions and coefficients. Interpolate the gradients of the solution to the grid from -0.3 to 0.3 in each direction for each of the two components. Plot the gradients for the first component. Plot the gradients for the second component. Solve a system of hyperbolic PDEs and evaluate gradients. Solve the problem for times 0 through 5e-3 in steps of 1e-4. You might have to wait a few minutes for the solution. Evaluate the gradients of the solution at fixed x- and z-coordinates in the centers of their ranges, 5 and 0.5 respectively. Evaluate for y from 0 through 10 in steps of 0.2. Obtain just component 3, the z-component. 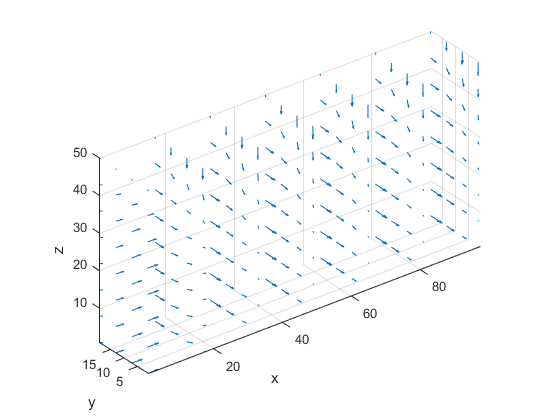 The three projections of the gradients of the solution are 51-by-1-by-51 arrays. Use squeeze to remove the singleton dimension. Removing the singleton dimension transforms these arrays to 51-by-51 matrices which simplifies indexing into them. Plot the interpolated gradient component grady along the y axis for the following six values from the time interval tlist. PDE solution, specified as a StationaryResults object or a TimeDependentResults object. Create results using solvepde or createPDEResults. x-coordinate query points, specified as a real array. evaluateGradient evaluates the gradients of the solution at the 2-D coordinate points [xq(i),yq(i)] or at the 3-D coordinate points [xq(i),yq(i),zq(i)]. So xq, yq, and (if present) zq must have the same number of entries. evaluateGradient converts query points to column vectors xq(:), yq(:), and (if present) zq(:). For a single stationary PDE, the result consists of column vectors of the same size. To ensure that the dimensions of the gradient components are consistent with the dimensions of the original query points, use reshape. For example, use gradx = reshape(gradx,size(xq)). For a time-dependent PDE or a system of PDEs, the first dimension of the resulting arrays corresponds to spatial points specified by the column vectors xq(:), yq(:), and (if present) zq(:). y-coordinate query points, specified as a real array. evaluateGradient evaluates the gradients of the solution at the 2-D coordinate points [xq(i),yq(i)] or at the 3-D coordinate points [xq(i),yq(i),zq(i)]. So xq, yq, and (if present) zq must have the same number of entries. evaluateGradient converts query points to column vectors xq(:), yq(:), and (if present) zq(:). For a single stationary PDE, the result consists of column vectors of the same size. To ensure that the dimensions of the gradient components are consistent with the dimensions of the original query points, use reshape. For example, use grady = reshape(grady,size(yq)). z-coordinate query points, specified as a real array. evaluateGradient evaluates the gradients of the solution at the 3-D coordinate points [xq(i),yq(i),zq(i)]. So xq, yq, and zq must have the same number of entries. evaluateGradient converts query points to column vectors xq(:), yq(:), and (if present) zq(:). For a single stationary PDE, the result consists of column vectors of the same size. To ensure that the dimensions of the gradient components are consistent with the dimensions of the original query points, use reshape. For example, use gradz = reshape(gradz,size(zq)). Query points, specified as a real matrix with either two rows for 2-D geometry, or three rows for 3-D geometry. evaluateGradient evaluates the gradients of the solution at the coordinate points querypoints(:,i), so each column of querypoints contains exactly one 2-D or 3-D query point. x-component of the gradient, returned as an array. For query points that are outside the geometry, gradx = NaN. For information about the size of gradx, see Dimensions of Solutions, Gradients, and Fluxes. y-component of the gradient, returned as an array. For query points that are outside the geometry, grady = NaN. For information about the size of grady, see Dimensions of Solutions, Gradients, and Fluxes. z-component of the gradient, returned as an array. For query points that are outside the geometry, gradz = NaN. 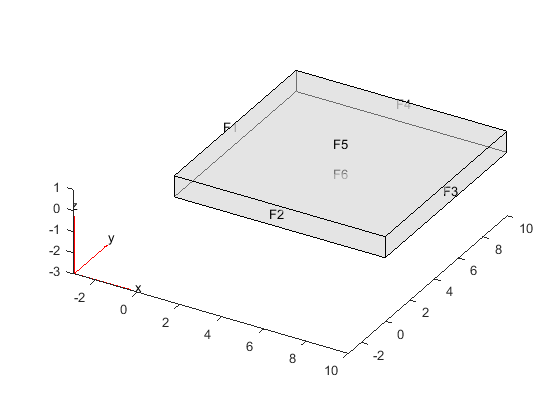 For information about the size of gradz, see Dimensions of Solutions, Gradients, and Fluxes. The results object contains the solution and its gradient calculated at the nodal points of the triangular or tetrahedral mesh. 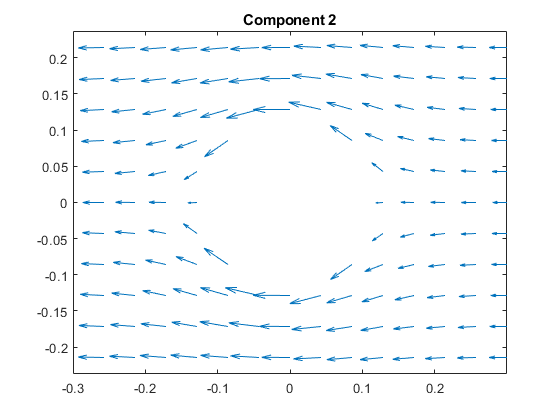 You can access the solution and three components of the gradient at nodal points by using dot notation. interpolateSolution and evaluateGradient let you interpolate the solution and its gradient to a custom grid, for example, specified by meshgrid.